The Morane-Borel monoplane (sometimes referred to with the retronym Morane-Saulnier Type A or simply the Morane monoplane) was an early French single-engine, single-seat aircraft. It was flown in several European air races. The Monoplane was a conventional design for its day, a mid-wing monoplane with fixed tailskid undercarriage. The wooden framework of the rear fuselage was left uncovered in some aircraft. Its powerplant was a 50 hp rotary engine driving a two-blade wooden propeller. The Monoplane achieved fame when Jules V�drines flew one to victory in the 1911 Paris-Madrid air race, the only competitor to finish the four-day course. 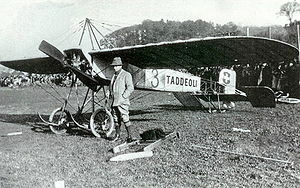 Emile Tadd�oli was another owner of a Morane monoplane. A float-equipped version flew in the round-Britain Hydro-Aeroplane trial of 1912. This led to the development of a two-seater, of which eight were purchased by the Royal Navy and used as spotter aircraft until the outbreak of World War I.
Taylor, Michael J. H. (1989). Jane's Encyclopedia of Aviation. London: Studio Editions. pp. 193. Morane-Borel monoplane Pictures and Morane-Borel monoplane for Sale.